A district of somewhat indefinite limits stretching for about 200 miles along the east coast of the Mediterranean and extending inland from five to fifteen miles. The eastern boundary was the Lebanon range, while Ptolemy ("Geography," v. 15, §§ 4-5) defines the northern border as the Eleutherus (Nahr al-Kabir) and the southern as the Chorseus (Karaje), although these limits can be regarded as only approximate. In the Old Testament there is no specific reference to Phenicia, the inhabitants of the region being usually termed Sidonians (e.g., Gen. x. 15; Judges iii. 3, x. 6, xviii. 7; I Kings v. 20, xvi. 31). The name under which the country is generally known is probably Greek in origin, for it seems to be a derivative from Φοῖνος "blood-red," "purple," in allusion to the rich dye of the murex which its inhabitants exported. The land is called Φοινίκη as early as the "Odyssey" (iv. 83, xiv. 291), although its people are termed almost indiscriminately Phenicians and Sidonians in the Homeric poems (e.g., "Odyssey," xiii. 272, xiv. 288, xv. 415, as contrasted with "Iliad," vi. 690; "Odyssey," iv. 616, xv. 118). The chief cities of the district were Acco, Achzib, Ahlab, Kanah, Tyre, Zarephath, Sidon, Berytus, Gebal, Arka, Zemara, Arvad, and Sin. It never formed a coherent kingdom, but a general hegemony was exercised over the entire region by one or another of the leading cities, especially Gebal (the Byblus of the Greeks) in the north, and Tyre and Sidon in the south. The age of these towns is unknown, although some of them must have been of considerable antiquity, for the El-Amarna tablets of the fifteenth century represent Tyre as a powerful metropolis. The Phenicians were undoubtedly of Canaanite stock (comp. Gen. x. 15), and, according to a tradition preserved by Herodotus (i. 1, vii. 89), came from the Red Sea (here denoting the Persian Gulf) to the coast of Syria. They probably belonged to an early Semitic invasion of Palestine before the Israelitish conquest. Although lists of early kings are given by Tatian ("Adversus Græcos," xxxvii.) and by Porphyry (cited by Eusebius, "Præp. Evang." x. 9, § 12), the ultimate source for both authors being Sanchuniathon, these records are scarcely trustworthy, and may be in great part apocryphal. It is not until the latter part of the sixteenth century B.C. that Phenician history really begins. At that period Thothmes I. invaded Syria. His victories were only transient; his son, Thothmes III. (c. 1503-1449), had a more lasting success. Capturing Zemara and Arvad, which alone offered any serious resistance, he made the former city the chief Egyptian fortress of Syria, and kept a rigid control over the entire country. A rebellion against Amenophis II. (c. 1449-1430) was quickly suppressed, and Thothmes IV. also maintained his power there, but the slack reign of Amenophis IV., toward the end of the fifteenth century, resulted in the conquest of the most of Phenicia by the Hittites. About 1350 Sethos I. endeavored to regain the country, but he was unable to secure more than the southern half of it, while his son, Rameses II., was forced to conclude a treaty with the Hittites by which they retained the territory north of a boundary which seems to have been the Nahr al-Kalb, north of Beirut. The gradual disintegration of both the Egyptian and Hittite suzerainties gave the Phenician cities an opportunity to develop. The first to exercise hegemony was Tyre, which, under Hiram, in the first half of the ninth century, was a seat of wealth and power. The historical sources relating to this city are chiefly the Old Testament and Josephus, the latter giving ("Contra Ap." i. 18, 21; "Ant." viii. 5, § 3; 13, § 2) the following list of rulers down to the founding of Carthage: Abi-Ba'al, Hiram I. (c. 968-934). Ba'al'azar I. (c. 934-918), Abd-'Ashtoret (c. 918-909), Metu-'Ashtoret (c. 909-897), Astherymus (c. 897-888), Phellas (c. 888), Ithobal (c. 887-876), Ba'al-'azar II. (c. 876-870), Metten (c. 870-841), and Pygmalion (c. 841-814). This list is based on Menander of Ephesus, who drew his information from the chronicles of Tyre. During the reign of Ahab, Ethbaal was king of Sidon, and married his daughter to the King of Israel (I Kings xvi. 31). Here again the Biblical record is supplemented by a fragment of Menander preserved by Josephus ("Contra Ap." i. 18), which gives the successors of Ethbaal as Ba'al II. (10 years), the judges Adoni-Ba'al (2 months), Kalba (10 months), Abbarus (3 months), and Metten and Ger-'Ashtoret (6 months), followed by the kings Balatorus (1 year), Mer-Ba'al (4 years), and Hiram III. (20 years). The invasion by the Syrians under Asshur-nasirpalin 876 marked the beginning of a new period of subjugation for Phenicia. He received tribute from a number of cities, including Tyre, Sidon, Gebal, and Arvad, but his son, Shalmaneser II., met with stout resistance in northern Phenicia, which joined the Syrian coalition that opposed the Assyrian king at Karkar in 854. The southern section of the country, on the other hand, submitted quietly, and paid tribute to both Shalmaneser and his grandson Hadad-Nirari III. It was not until the reign of Tiglath-pileser III. 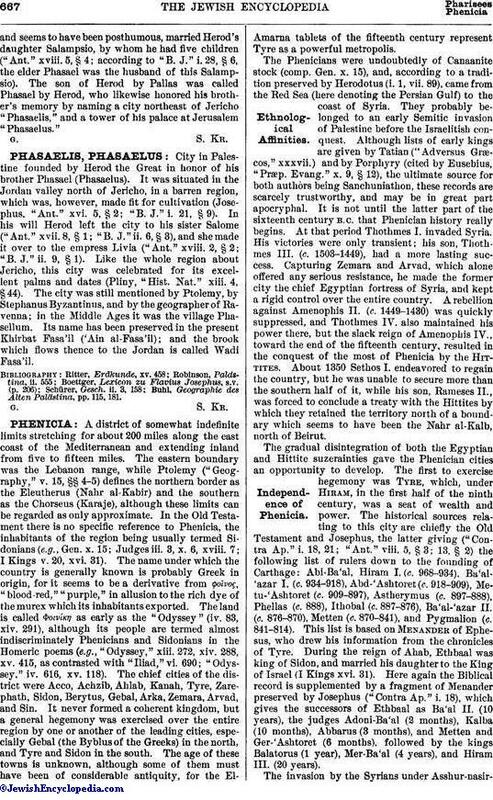 (734-728) that the Assyrian conquest of Phenicia was really complete. Thus far only three Phenician cities are mentioned as important, Arvad, Gebal, and Tyre; for the Eleutherus region now formed a part of the kingdom of Hamath. Even the great cities apparently submitted with little resistance, for in 738 Matan-Ba'al of Arvad, Shitti-Ba'al of Byblus, and Hiram II. of Tyre were paying tribute to Tiglath-pileser. The last-named city, which still controlled the greater part of the coast, became restless after a few years, although without avail; but during the reign of Sennacherib (705-681), Elulæus (Luli) of Tyre joined an anti-Assyrian coalition formed by southern Syria and headed by Hezekiah, the result being the defeat of the Phenician king, who fled to Cyprus, while a new ruler, Itu-Ba'al (Ithubal), was enthroned in Sidon by his conqueror. Sidon itself rebelled against Esarhaddon (680-668), but after a stubborn resistance it was reduced by the Assyrians, and its king, 'Abdi-Milkut, who had sought refuge in Cilicia, was taken and executed, the city itself was destroyed, and its inhabitants were deported. Meanwhile, though the power of Tyre was broken, the city itself resisted capture, and neither Sennacherib, Esarhaddon, nor Assurbanipal was able to reduce it until the last-named monarch finally captured Egypt. Then Ba'al of Tyre surrendered, but was treated with all honor and ranked as the chief of the Syrian and Cyprian vassals of Assurbanipal. 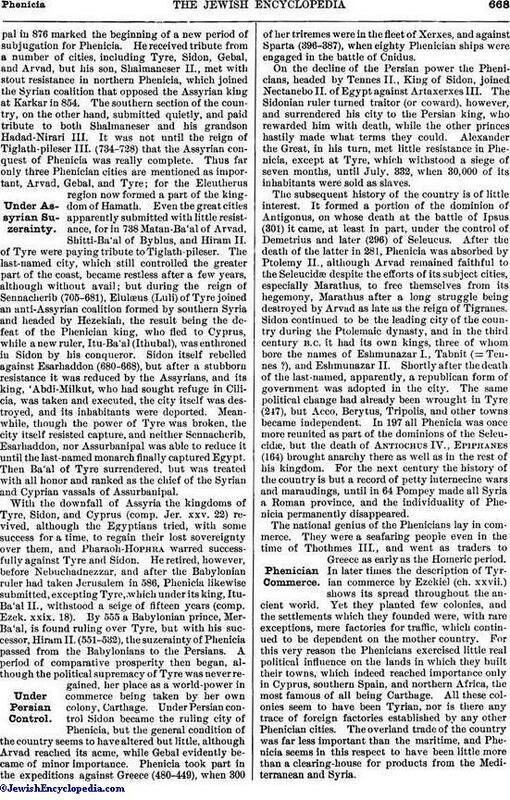 With the downfall of Assyria the kingdoms of Tyre, Sidon, and Cyprus (comp. Jer. xxv. 22) revived, although the Egyptians tried, with some success for a time, to regain their lost sovereignty over them, and Pharaoh-Hophra warred successfully against Tyre and Sidon. He retired, however, before Nebuchadnezzar, and after the Babylonian ruler had taken Jerusalem in 586, Phenicia likewise submitted, excepting Tyre, which under its king, Itu-Ba'al II., withstood a seige of fifteen years (comp. Ezek. xxix. 18). By 555 a Babylonian prince, Mer-Ba'al, is found ruling over Tyre, but with his successor, Hiram II. (551-532), the suzerainty of Phenicia passed from the Babylonians to the Persians. A period of comparative prosperity then began, although the political supremacy of Tyre was never regained, her place as a world-power in commerce being taken by her own colony, Carthage. 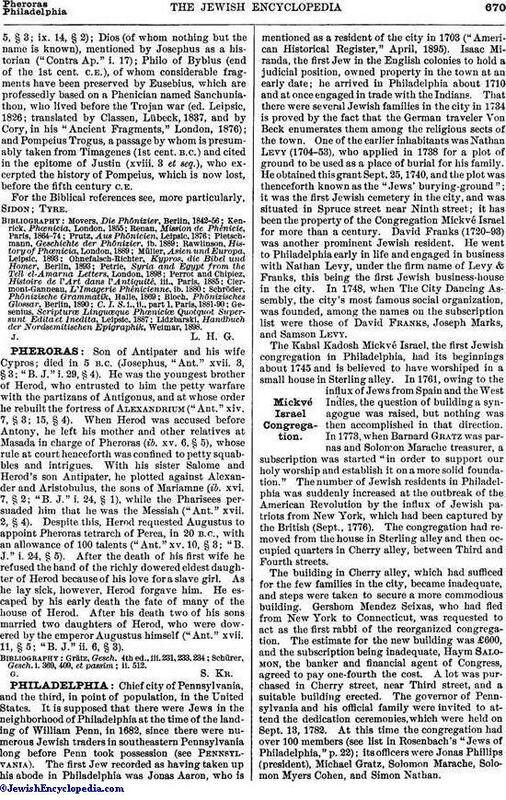 Under Persian control Sidon became the ruling city of Phenicia, but the general condition of the country seems to have altered but little, although Arvad reached its acme, while Gebal evidently became of minor importance. Phenicia took part in the expeditions against Greece (480-449), when 300 of her triremes were in the fleet of Xerxes, and against Sparta (396-387), when eighty Phenician ships were engaged in the battle of Cnidus. On the decline of the Persian power the Phenicians, headed by Tennes II., King of Sidon, joined Nectanebo II. of Egypt against Artaxerxes III. The Sidonian ruler turned traitor (or coward), however, and surrendered his city to the Persian king, who rewarded him with death, while the other princes hastily made what terms they could. Alexander the Great, in his turn, met little resistance in Phenicia, except at Tyre, which withstood a siege of seven months, until July, 332, when 30,000 of its inhabitants were sold as slaves. The subsequent history of the country is of little interest. It formed a portion of the dominion of Antigonus, on whose death at the battle of Ipsus (301) it came, at least in part, under the control of Demetrius and later (296) of Seleucus. After the death of the latter in 281, Phenicia was absorbed by Ptolemy II., although Arvad remained faithful to the Seleucidæ despite the efforts of its subject cities, especially Marathus, to free themselves from its hegemony, Marathus after a long struggle being destroyed by Arvad as late as the reign of Tigranes. Sidon continued to be the leading city of the country during the Ptolemaic dynasty, and in the third century B.C. it had its own kings, three of whom bore the names of Eshmunazar I., Tabnit (= Tennes ? ), and Eshmunazar II. Shortly after the death of the last-named, apparently, a republican form of government was adopted in the city. The same political change had already been wrought in Tyre (247), but Acco, Berytus, Tripolis, and other towns became independent. In 197 all Phenicia was once more reunited as part of the dominions of the Seleucidæ, but the death of Antiochus IV., Epiphanes (164) brought anarchy there as well as in the rest of his kingdom. For the next century the history of the country is but a record of petty internecine wars and maraudings, until in 64 Pompey made all Syria a Roman province, and the individuality of Phenicia permanently disappeared. The national genius of the Phenicians lay in commerce. They were a seafaring people even in the time of Thothmes III., and went as traders to Greece as early as the Homeric period. In later times the description of Tyrian commerce by Ezekiel (ch. xxvii.) shows its spread throughout the ancient world. Yet they planted few colonies, and the settlements which they founded were, with rare exceptions, mere factories for traffic, which continued to be dependent on the mother country. For this very reason the Phenicians exercised little real political influence on the lands in which they built their towns, which indeed reached importance only in Cyprus, southern Spain, and northern Africa, the most famous of all being Carthage. All these colonies seem to have been Tyrian, nor is there any trace of foreign factories established by any other Phenician cities. The overland trade of the country was far less important than the maritime, and Phenicia seems in this respect to have been little more than a clearing-house for products from the Mediterranean and Syria. Of the system of government in Phenicia few details are known. The country seems, however, to have been divided into a number of local monarchies with a hereditary succession, although the line of kings was broken for a time, at least in Tyre, by judges, which recalls in a measure the "suffetes" of the Phenician colony of Carthage and the "shofeṭim" of Israel. The king was assisted, furthermore, by a senate, which in Sidon appears to have contained a hundred members. The general type of government was evidently thoroughly aristocratic. The religion of the Phenicians, like their government, can be sketched but vaguely, although it was plainly a characteristic Semitic cult. In its basis it was polytheistic and naturalistic, and it contained distinct traces of fetishism, later developed into idolatry. There are likewise clear vestiges of phallic worship in the Asherah, which finds its close analogues in Israel despite the efforts made to suppress it there. Each locality had its god ("el," "ba'al") or goddess ("'ashtart" ["'ashtoret"], rarely "ba'alat"), and individual deities presided over various spheres of activity. Although the gods are frequently mentioned in the inscriptions, their characteristics are seldom given, and this very colorlessness may have contributed to the gradual approach to a syncretistic quasi-monotheism which was occasionally shown in the later period of the religion if the statements of Philo may be believed. Beside the vague but powerful deities who had no real names, such as Ba'al-Ṣidon ("Lord of Sidon"), Ba'alat-Gebal ("Lady of Gebal"), Ba'al-Berit ("Lord of the Covenant"), Ba'al-Shamem ("Lord of Heaven"), 'Ashtart-Shamem ("Lady of Heaven"), Melḳart ("King of the City"; usual name of Ba'al-Ṣor, "Lord of Tyre"), and Adoni-Shemesh ("Lord of the Sun"), some fifty gods are found with names. The most important of these are as follows: Eshmun ( ), identified by the Greeks with Æsculapius; Gad ( ), apparently a god of good fortune; Sakkun ( ), of uncertain functions; Ṣid ( ), probably a deity of hunting or fishing; and the goddesses 'Anat ( ), a deity of war, and Tanit ( ), who is almost always mentioned together with Ba'al and may have been an earth-goddess. The Phenicians were not free from foreign influences in their religion, for the Ba'alat of Gebal was directly modeled, both in concept and representation, on the Hathor or Isis of Egypt; Reshep ( ), probably a storm-god, was borrowed from Syria; while Hadad ( ) represents the Babylonian Ramman; and the Assyrian Nergal was incorporated directly into the Phenician pantheon. The cult of the deities was conducted especially on high places, and, in close conformity with the nature-worship which was so important in Phenician religion, waters and trees had peculiar divine attributes. Temples were erected, although they were less important than in most Semitic cults, and even in them the old usage survived of setting up the divine images, votive pillars, and similar objects in the courtyard rather than in the shrine itself. Sacrifices of various animals and fruits were offered, and, in time of special need, human victims as well, while the trend toward the fertility-cult is strikingly shown in the custom of sacred prostitution so prevalent in Semitic religions. The same general kinship with Assyro-Babylonian and Hebrew religion was shown in the Phenician eschatology, which believed vaguely in a future life, although it must be passed in the joyless shadows of Sheol. In art the Phenicians were essentially eclectic, borrowing especially from the Assyrians and Egyptians, although in Cyprus and southern Spain archaic Greek influence may be traced, and in architecture some Persian traces seem evident. It was in the minor arts, however, particularly working in metal, glass, terra-cotta, and textile objects, that the Phenician genius found its greatest degree of individuality, especially between 1000 and 500 B.C. The chief architectural remains are found at Arvad, Berytus Sidon, and Eryx in Sicily, as well as in the remnants of the harbor constructions at Thapsus and the sarcophagi of Amathus, while the bronze votive shields from Mount Ida in Crete, the pateræ from Dali, Palestrina, and Curium, and the glass-work—which was the finest of antiquity—are the most striking relies of the minor arts of this people (see Glass). In jewelry and gems, as in decoration generally, the Phenicians were rather elaborators of borrowed types than inventors of new forms. The Phenician language was purely Semitic, forming, with the Canaanite glosses of the El-Amarna letters, Hebrew, and Moabite, the Canaanite group of this linguistic family. It was written with an alphabet of twenty-two letters, which formed the basis of the Greek and other European scripts and very possibly of the Indian system as well. Its own origin is not yet definitely determined, although the Babylonian and Egyptian alphabets, and even the Hittite, may have influenced it. The inscriptions are very numerous, although comparatively few have been found in Phenicia itself, the greater number coming from Cyprus, Greece, Egypt, the islands of Melitus, Gaulos, Sicily, Cossura, Sardinia, and Corsica, and also from Africa, Italy, France, and Spain. The longest are those of Larnaka (29 lines), Sidon (22 lines), and Marseilles (21 lines). Few have any historical interest, however, and they date for the most part at the earliest only from the time of the Persian conquest, the oldest being assigned to the ninth century B.C. The only non-linguistic value of these texts lies almost entirely in the barren lists of names of kings and gods which they contain. There is, however, a valuable fragment of the language preserved in the "Pœnulus" of Plautus (930-949, 995, 998, 1010, 1013, 1016-17, 1023, 1027, ed. Goetz and Schoell). 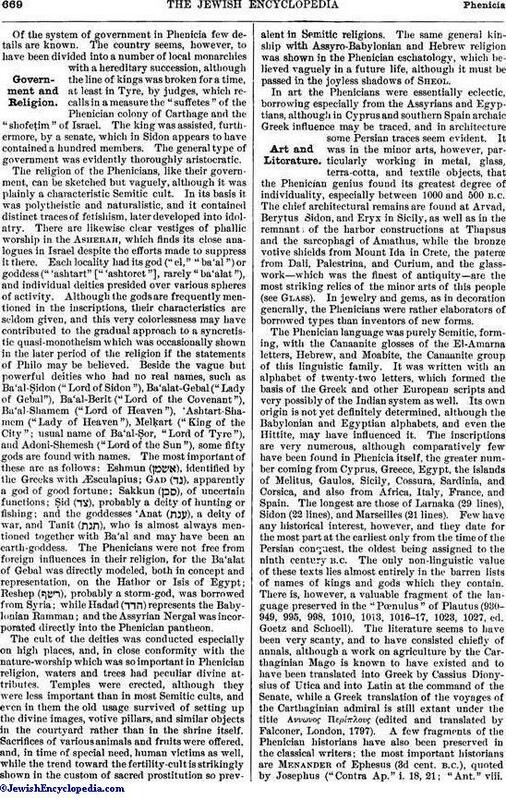 The literature seems to have been very scanty, and to have consisted chiefly, of annals, although a work on agriculture by the Carthaginian Mago is known to have existed and to have been translated into Greek by Cassius Dionysius of Utica and into Latin at the command of the Senate, while a Greek translation of the voyages of the Carthaginian admiral is still extant under the title "Αννωνος Περίπλους (edited and translated by Falconer, London, 1797). A few fragments of the Phenician historians have also been preserved in the classical writers; the most important historians are Menander of Ephesus (3d cent. B.C. ), quoted by Josephus ("Contra Ap." i. 18, 21; "Ant." viii.5, § 3; ix. 14, § 2); Dios (of whom nothing but the name is known), mentioned by Josephus as a historian ("Contra Ap." i. 17); Philo of Byblus (end of the 1st cent. C.E. ), of whom considerable fragments have been preserved by Eusebius, which are professedly based on a Phenician named Sanchuniathon, who lived before the Trojan war (ed. Leipsic, 1826; translated by Classen, Lübeck, 1837, and by Cory, in his "Ancient Fragments," London, 1876); and Pompeius Trogus, a passage by whom is presumably taken from Timagenes (1st cent. B.C.) and cited in the epitome of Justin (xviii. 3 et seq. ), who excerpted the history of Pompeius, which is now lost, before the fifth century C.E. For the Biblical references see, more particularly, Sidon; Tyre. Lidzbarski, Handbuch der Nordsemitischen Epigraphik, Weimar, 1898.